Mandal, Zonal, District Level School Games in Mahabubabad District: DEO Mahabubabad has decided to conduct sports in Mandal level, Zonal level and District Level is proposed from 21.08.2017 to 08.09.2017 under age group of 14-17 years. The tournaments will be conducted in three tier system i.e., Mandal level, Zonal level and District Level. Proc.Rc.No.5999/A3/SGFI/2017; Date:19.08.2017:: Subject: School Education - Conduct of school games in Mandal level, Zonal level and District Level - Instructions Issued - Reg. Ref: 1. Representation of District Organizing Secretary, SGFI, Mahabubabad dt: 19.08.2017. The attention of all the Headmasters of PS/UPS and HS and Mandal Educational Officers in the District is invited to the reference cited and they are informed that it is decided to conduct sports in Mandal level, Zonal level and District Level is proposed from 21.08.2017 to 08.09.2017 under age group of 14-17 years. 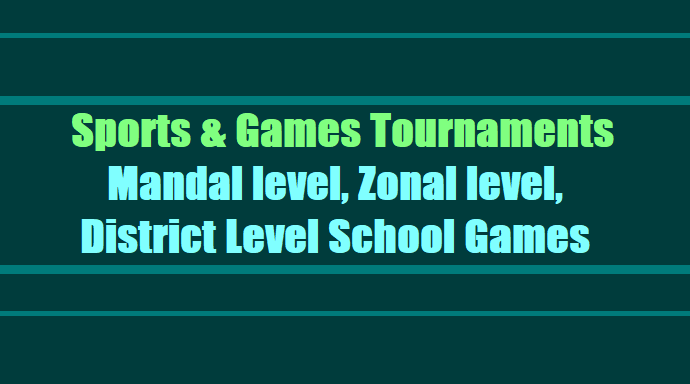 The tournaments will be conducted in three tier system i.e., Mandal level, Zonal level and District Level. U-14 years B & G Studying below 8th class, born on after 01.01.2004 Convener, Mandal School Games depending on the facilities available shall be decide events. All the Headmasters of PS, UPS & HS, Mandal Educational Officers and Conveners in the District are requested to conduct school games as per the above schedule and to submit report compliance without fail.